South Woods State Prison is located in Bridgeton New Jersey, part of Cumberland County. It is a mixed custody facility that houses over 3,420 male inmates in three medium security units, and a single minimum security unit. Additionally, there is an Extended Care Unit responsible for housing inmates in the infirmary, and a Palliative Care Unit. Offenders can receive medical and mental health treatment on-site. While incarcerated at South Woods State Prison inmates can receive vocational training and take educational courses to earn a GED. Social and religious service are also available to inmates willing to participate. 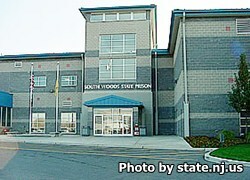 Visiting at South Woods State Prison is on an alternating schedule by the unit the inmate is currently in. Visiting for H1, H2, H3, H4, H5, H6, and ECU occur on Saturdays and Sundays in two alternating sessions from 8:30am-10:30am and 1pm-3pm (registration is 8am-9:30am for the morning session and 11:30am-1pm for the afternoon session). Because the units will alternate between the morning visits and afternoon visits you will need to contact the facility or view the current schedule in a .pdf format here. Visiting for the Minimum Unit (M1, M2) is on Saturdays and Sundays from 8:30am-10:30am and 12:30pm-3pm (registration is from 8am-9am and 12pm-1pm).